With two wins under their belts since the New Year, Wigtownshire were hoping their break from action last weekend due to a waterlogged pitch at Loch Lomond would not impact on their performance. Their visitors at London Road on Saturday Uddingston, holding third place in the league, were hoping to get back to winning ways. Last week they lost their way, throwing away a healthy first half lead against top team Strathaven, to lose heavily by the final whistle. With both teams set on getting the win, the expectant supporters who braved the elements, in particular, the gale force westerly wind, were looking for fireworks at London Road when they gathered on the touch line on Saturday. The home side kicked off, playing towards Ladies Walk with the wind at their backs. Uddinston fielded the kick and came back hard, sending the ball wide and making good ground. Cold hands and a scrambling defence forced a kick on and “Shire” had the scrum feed thirty metres from the line. A solid platform at the set piece allowed No 8, Adam Paxton, to pick up and attack the defence. As Uddinston broke to cover him, he lobbed the ball back inside over their heads. Jason McKie running the inside line gathered the ball and in a flash sprinted under the post for the first score of match. Kieran Little kicked the conversion to add to the try and with two minutes on the clock, Wigtownshire had a seven point lead. At the restart the Uddingston kick went out of play on the full. Scrum “Shire” in the middle of the park and they were off again, charging for the line. This time they knocked on and the visitor’s had the scrum feed. This gave the home side a chance to unleash the power of their driving defensive scrum which has become a feature of their game recently. The visitors did manage to get the ball away but the pressure kept them very much on the back foot. With wind in their faces, the option of kicking was not available to them either. They worked hard to break out but “Shire” turned the ball over and set about going through the phases. This brought them back onto the Uddingston line, showing great control, they were working hard for each other. Eventually, Adam Paxton broke the defence, crashing through and over the line for a try. Little added the conversion. With the “Shire” very much in control, the visitors just could not get into their half. However, it was very clear to everybody that the home side had to build a big lead because the wind advantage was a major player in the game. Uddingston worked very hard to frustrate the local lads, playing on the edge of the law, to prevent quick ball from scrums and rucks and little chance of fair contest at hooking the ball in the scrum. It was a full fifteen minutes before Wigtownshire managed to get back into a scoring position. The forwards drove hard toward the line, rucking and driving, with support runner carrying up. 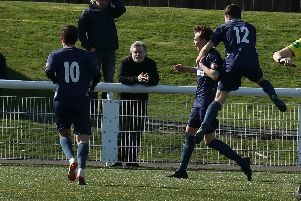 When the ball was released to the backs, referee Mr Connal indicated advantage for an offside against the visitors, but the local boys stuck to their game. This time the ball came out clean and quick, young Ben McColm was on hand to break clean through, to score his first senior try, under the posts. Little added the conversion. For the remainder of the half, despite their efforts, the home side could not add to their tally. The supporters on the touch line were left wondering if they had done enough. From the restart that question was to be answered in double quick time. Wigtownshire fielded the ball from the kick off, but unfortunately knocked on. Uddingston did not need to be asked twice, gathering the ball they took full advantage of possession going forward. Their centres broke up the middle of the park and drew in the “Shire” defences. The ball was passed out to winger who swept round the last player and behind the post to score. First play of the half and with the conversion added seven points pulled back. Then it was “Shire” turn to fail at the restart with the wind preventing the ball travelling far enough. Scrum to “The Villagers”, a clean take gave them good ball and they came forward again. Their powerful running with ball in hand once again cut through “Shire” defenders, this time as they went in to score, a last gasp tackle forced a knock on in goal. No try, scrum five, Wigtownshire ball. The home scrum set well and produced good ball, but the visitors came up with determination. A rush clearance kick was blocked, Uddingston gathered and zipped the ball to their wing. No mistakes this time as the try was scored in the corner. This time the conversion kick was a different prospect and wind came into play blowing away any chance of the extra points, but with sixteen minutes of the half played the signs were very ominous. The local lads, seeing the writing on the wall, dug very deep. They gathered themselves and fought the way back into the game, no quarter was asked and none was given as both sides fought to get an advantage. The “Shire” took a further twelve minutes to break into the Uddingston half. It was Munro McConnell who made a storming run, heading for the line. He was brought to a halt by the referee’s whistle as a melee broke out elsewhere on the park. Once order was restored “Shire” appeared to be gaining the upper hand. They managed to get on the front foot, the power plays at set pieces and ruck brought them right onto the Uddingston try line, but they were stopped short. Awarded a scrum, “Shire” drove towards the line as the game moved into injury time. A fumble on the line gave the visitors a penalty. The wind again took them all the way down the field, but the home side regrouped and fought back. There was a full eight minutes of injury time played before Mr Connal eventually blew his whistle to bring the game to an end, Wigtownshire winning 21 point to 12. As anticipated this was very competitive game, with two sides playing very different styles of rugby in very difficult conditions. Everyone on the touch line was royally entertained by the efforts of both team. Mind you it is doubtful the local support have any nails left, especially with the extended extra time at the end of the game. Wigtownshire now have a two week break before they face the top side in the league, Strathaven, on Saturday 13th February 2016. This will be another mountain for the local boys to climb, but it is not insurmountable if they keep playing for each other as they did at the weekend. With three wins in a row, two against higher placed opposition, there is no reason why they cannot aim high and get another win. It most certainly will be a game worth watching regardless of the winter weather. Team: K Little, S Cameron, J McIntosh (Capt), B McColm, J Gallacher, Campbell Reid, J Dalrymple; M McConnell, G Keith, D Watson, R Dewar, G Dunlop, J Little, J McKie, A Paxton. Replacements: C Dickson, R McCreadie, D Kelly, C Lammie, A McMaster, H McGeoch, E Jamieson.